PERMANENT RESTORATIONS THAT FUNCTION LIKE NATURAL TEETH. Looking for the smile you've always wanted? Your search ends here. Award Winning Dental Care Clinic. No more tooth loss, get stronger teeth than natural and look as real as them too. As a leading dental health clinic, the Brighton Implant Clinic is renowned for their cosmetic restorations and achievements in dental implant cases. Founder and principal dentist Dr Bruno Silva opened his first clinic in 2009, Hove, East Sussex. 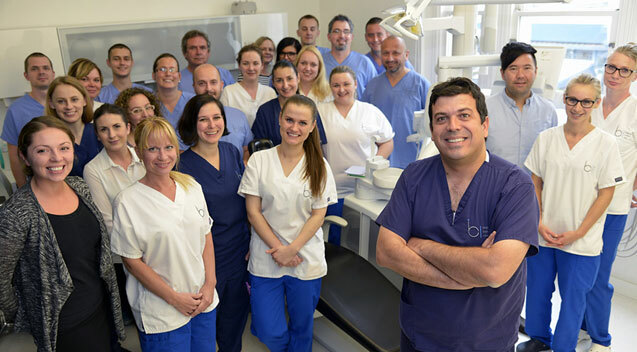 Dr Silva and the team promise to provide their patients with first class dentistry with first class patient care, be that in routine procedures, cosmetic treatments, or complex cases in dental implantology. Cosmetic dental procedures can improve your smile and the appearance of your teeth. Dental Implants are the most advanced dental procedure in mouth rehabilitation. Digital Smile Design (DSD) is a leading software in dental design and cosmetic dentistry. Our fully qualified technicians can make dentures for you from start to finish - in one day. Tooth whitening is a simple, safe and effective method of removing everyday staining, and creating a whiter and brighter smile. The all-on-four procedure is a complete restoration of the upper and or lower arch. Brighton Implant Clinic helped Sharon to smile again. Brighton Implant Clinic helped David Bryant smile again. Brighton Implant Clinic helped Josie regain her smile. Dental implant treatment can change your life. Looking for Affordable Dental Implant Treatment In UK? Single Dental Implant, starting from £995 Including the Implant, Abutment, and Crown.